OK, it’s a New Year and I have a confession to make. I didn’t really accomplish the work discussed in the last 18 articles in 18 months. I’ve actually been at it for 2 or 3 times that long. And it’s happened. My articles have caught up with my current progress. So another hard truth of the restoration process. It’s going to take a lot longer than you can possibly imagine! The upshot of all this is that I’m going to be hard pressed to give Jerry 1400 words every month. So my New Years resolution is going to be easy to keep. I’m only going to write an article when noteworthy progress has been made. This looks like it will lapse into an every other month thing but we’ll see. My engineering firm takes the week off between Christmas and New Years so I was looking forward to a long week in the restoration shop. Yeah, right! I think it was the Tuesday after Christmas before I had a day to myself, what with the kids visiting from out of town and Christmas social responsibilities to keep. But eventually some real progress was made. I probably spent the better part of the week whipping the drivers side door into shape. First came rust repair, as the bottom area of the door is an excellent water collection area for any water that gets past the door glass seal. 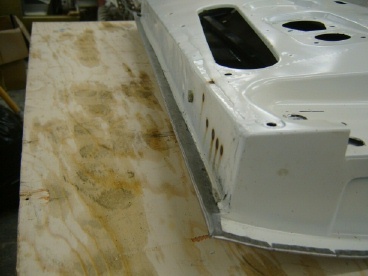 After I blasted off the artful bondo job applied by a previous bodyshop, I saw that it was pretty bad. So I proceeded to plan my repair. As I discussed in a previous article, new door skins are theoretically available but when I checked with my supplier I found that they had been backordered for months. Since the lower part of the door has no compound curves or whatnot, I decided to tackle the metal fabrication myself. There was rust at the very bottom and evidence of previous collision damage repair further up but about half way up the door panel things looked pretty good. So I scribed a horizontal line across the door and proceeded to cut with my cut-off grinding wheel. The outer door skin is folded 180 degrees around a flat edge presented by the inner door panel. For the scrap piece, one just needs to grind through the outer edge of the lip until things begin to separate. 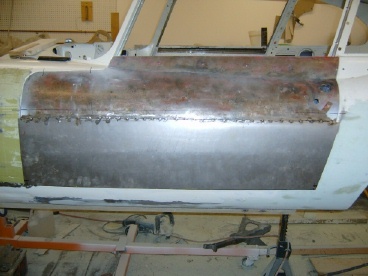 At the bottom of door, additional metal was removed where the rust resided. When done, I had a door that was a mere shadow of its former self. I had previously purchased a 4′ x 8′ piece of 22 gage sheet steel from Dillon Supply in Raleigh. They are right next to the Budweiser distributor. Maybe I should have bought a couple of kegs while I was at it! I first made a cardboard pattern. Hang the remaining door on its hinges and line the top part up vertically and fore to aft. Then place marks at the two lower corners where the edge of the door will be. These marks are one panel gap or ~ 3/16″ inside of the door opening. Tape your cardboard across the cut line midway up the door and drape it down over the marks you just made. Transfer the marks to the cardboard. When you connect these marks you have the outer edge of the door skin identified. These will be the fold lines in the sheet metal. Add about a ½” beyond these lines as the actual outside edge of your pattern. Transfer the pattern to the sheet steel and cut out your skin. A side issue is that the cut line across the existing door skin will most likely be wavy once freed from its previous bonds. You will need a straight edge to work against. I bought a piece of 1″x1″x 3′ long steel tube from Home Depot. After grinding/blasting/sanding the inner door skin down to bare metal, I used structural 2 part epoxy to bond the tube to the back side of the door skin. Use the kind that sets up in an hour, not the 5 minute kind. And bring plenty of C-clamps into use to help the skin lay flat on the tube. By the way, it may set in an hour but it takes 1 or 2 days to really form a good bond so leave those clamps in place as long as possible. While waiting for the epoxy to cure, I proceeded to cut out and install repair pieces for the door bottom and the inner panel. These are mostly flat pieces with one or two 90 degree bends. As most of this work would be covered by the door panel upholstery, I didn’t have to worry about making invisible flush joints so I used lap joints and intermittent spot welds. Don’t forget to recreate the little L shaped brackets that lie in the door bottom and position the bottom of the window glass tracks. The original brackets were mounted with studs integral to the door bottom. I drilled holes in the new sheet metal, inserted a bolt from the outside in with some epoxy on the head and waited for it to cure by clamping it temporarily with nut. After it was dried, I used my grinder to thin and shape the head of the nut into a thin, flat circle. Although not exactly like the original, it will be very unobtrusive after painting. Next I tidied up the inside of the door. I sandblasted everything and applied a coat of epoxy primer. Next I used contact cement to apply a sheet of sound deadening material to the inside of the door skin. I added a similar piece of sound deadening material to the inside of my repair skin, since once the skin is installed it becomes infinitely more difficult to apply it. It was time to mount the door skin. First I just clamped it into position and hung the door, just to make sure I hadn’t totally dropped the ball on my pattern development. Things looked pretty good. By the way, you will take the door on and off its hinges countless times so get used to it. It’s a little tricky as a one man job but without the weight of the glass and everything it can be done. Satisfied that the door skin was about the right shape I tacked welded it across its top edge, next to the square tube that I had epoxied in. Hang the door again. Make sure it is in position vertically and fore to aft. Transfer your marks from the outer door frame to the new skin. Take the door back off and to your work table. Now for the moment of truth. Its time to bend over the edges. I went with the long bottom horizontal edge first. I clamped a heavy board across the bend line to give me a bend line to work against. 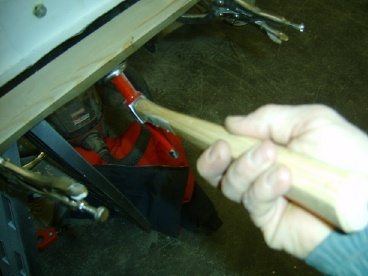 Gradually work the edge with your hammer and go from no bend to a 90 degree bend. At this point, the board has to go. But by now the bend line is established and as long as you don’t get too aggressive, you can use your hammer to go beyond 90 degrees. Very soon you will have to capture the bent edge over the raw edge of the inner door frame. From this point on, you are capturing the edge of the inner door frame as the meat in a door skin sandwich. 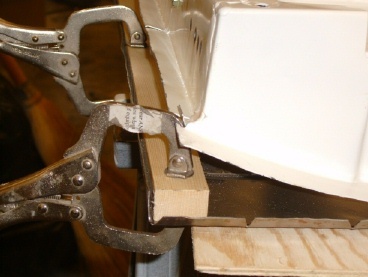 Continue until the lip of the door skin is bent substantially back on itself, about 180 degrees. At this point you might want to hang the door again for another test fit. If everything looks OK, go for the two vertical edges. Since these edges have a slight curvature, you will need to snip small V shaped segments every couple of inches so the metal doesn’t pucker. Draw your bend line with a felt tip marker. Since a board won’t fit on this curved bend line, I made the initial bend with pliers, snugged right up to the bend line. Once the bend line is established, switch to the hammer. Before you know it, these edges will also be bent 180 degrees back on themselves. Now you definitely want to hang the door and check the fit. Its not impossible at this point to unfold the metal and establish a slightly different line. I had to do this on the rear edge as I wasn’t satisfied with the panel gap. When your sure you’ve got the right bend line, use your hammer with a dolly to flatten the edge nicely. Now go open a beer and admire your work!